I haven't quite mastered the art of the no-buy (or low-buy), though I am drawing inspiration from Liz over at Beauty Reductionista. Chances are I'm not likely to anytime soon - I'm a hoarder collector. Blame my magpie Pisces soul, and its inability to resist anything pretty and shiny. 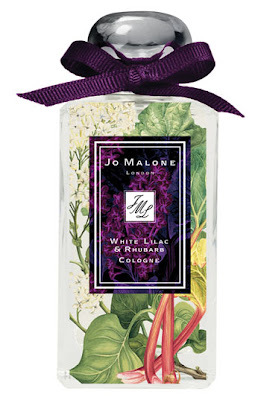 I'm not a big Jo Malone fan. I've found her fragrances to be a little tame, honestly. But I freakin' LOVE lilac. And isn't the botanical print on the bottle just precious? I am going to wait until I have a chance to sniff this in person when I'm in New York, because 110$ isn't exactly loose change. 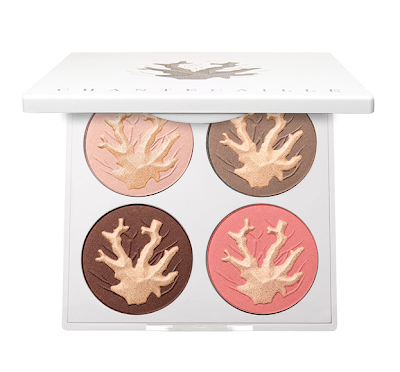 The Coral Reefs palette from Chantecaille. Do I even need to explain this one? It's stunning. Absolutely stunning. And from the swatches I've seen, worthy of a splurge. I've convinced myself (barely) to wait for a promo code from www.beautyhabit.com. In the meantime, here is an incredibly imprecise lip swatch of one of the Lancome Rouge in Love lipsticks. Not the one I picked up, as I have an overabundance of fuchsia lipsticks, but a lovely one all the same. This one was swiped on really quickly and blotted down. So what are you guys currently lemming or hauling? Oooh! The new EL blush! I so want to try one of them, but I'll have to hold out since I already tripped up once on my blush ban. :) At least try, right? The Chantecaille palette is gorgeous! I'm a huge fan of their products-you won't be disappointed! And I love Lilacs too! I want to smell it first too though! When are you going to NY? Ooh, I'll have to read through your past entries for your thoughts on Chantecaille! OMG what are you trying to do to me, woman?!? I want this post to come to life and march straight into my makeup train case! I've been eyeing that Jo Malone perfume for my next purchase and now you've put the Chantecaille quad on my radar. Gaaaah. I'm no expert on downsizing. Just trying to stay sane among all the beauty that's thrown at us lately! 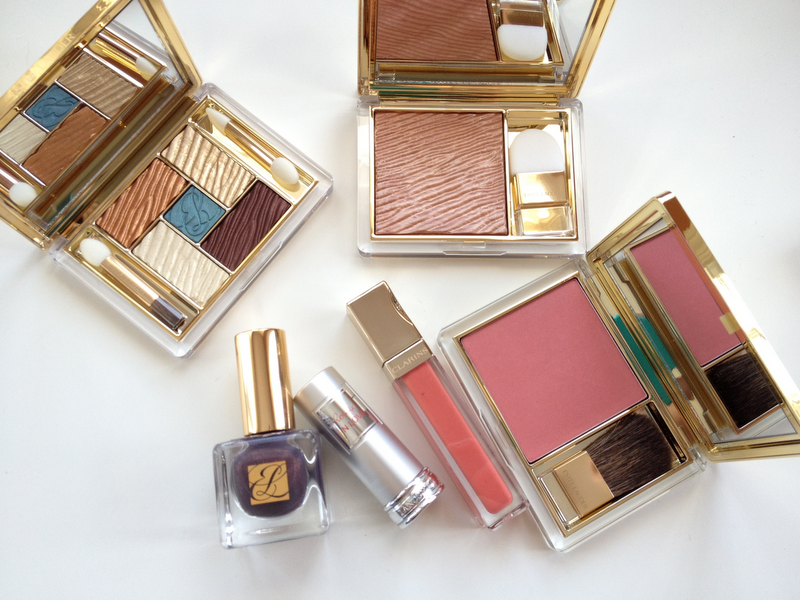 Isn't that Chantecaille quad to die for? It's making me all kinds of avaricious. I may have to trek down to Holt's to see if they have it, just so I can pet it in person. It's nuts how much there is out there, and it feels like brands are just stepping up their game with every season. Did you see the Guerlain Pucci preview. It is...OMG. I'm saving up for it as of right now. That Chantecaille palette....to die for! Does one wear the colours, or sit gazing at it in stupefied wonder? PS: some proceeds from the sale of this palette also benefit the endangered coral reef foundation...yet another reason! I'd wait to sniff the fragrance as well, and while I love lilacs (the flower), I'm not a floral person myself....I need to be surrounded by more muskier/vanilla/exotic scents. That being said, I love citrusy scents for the lighter weather. Like I already told you, I didn't have time to play with the other makeup at the EL counter, although I did swatch the lacquer, but I held back; for some reason the shade didn't call to me...I'm guessing a return trip (when I'm not in a freakin' hurry) is in order to I can make a qualified decision, am I right?! Ok...best question for last: when's your birthday? Yeah, this one might be a Shove It Under Glass And Ogle palette. Did you ever see any of the other ones - the Turtle or Tiger palettes? Beautyhabit still has the latter. So, SO tempted. I adore lilac, and enjoy gardenia very much, but I'm definitely more of a musk/spice girl as well. Which brands do you generally favor? And by birthday is the 18th of March. When is yours? As to perfumes, I don't like any of the more commonly available brands at the department stores; they always seem to go a little rancid on me (or maybe that's what I tell myself). I love some Hermès scents, Bond No. 9, Tom Ford and by Kilian, to name but a few! I had picked up Metallic Sage when it was released, and didn't swatch it until a few weeks ago, can you believe? I love it when the sun hits it, but in other lighting, I'm on the fence - need to wear it a bit more to see what it tells me, lol! I have a few Tom Ford decants, but haven't bitten the bullet on that one yet! I do find that I can't wear most commercial perfumes. They either turn rank, or spike a migraine. I think it's because of the kind of synthetic musk they use, or maybe the fixative? I got into small companies doing natural perfume oils and EdPs (like BPAL, Ayala Moriel, Sweet Anthem) a while back, and that opened up a whole other world to me. I think you'll probably be less impressed by Molten Lava. It's beautiful under the store lights and other strong lighting, a little murky otherwise. Wow, that is quite the birthday streak!